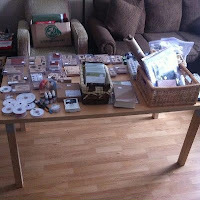 stampwithamber - Amber Meulenbelt, independant Stampin' Up! demonstrator: Thank you! Thanks to everyone who came out yesterday to my Open House / Retired Stamp sale - I think everyone enjoyed the make-n-take! And since I didn't have too many stamps, paper or ribbon to pack up afterwards, I think everyone also was able to take advantage of some sale items too! most of the older digital content discs are now being sold for only $1! Get them before they're gone! The 12" x 12" Early Espresso Album is being discontinued; and supply is running low; if you want one, get it before they're gone!